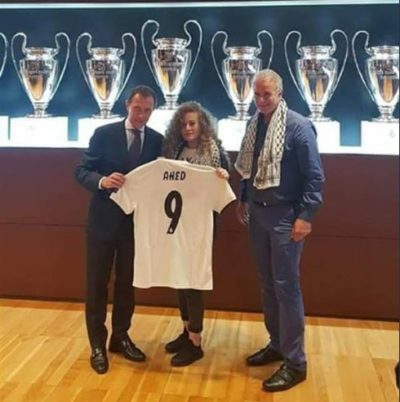 I have written above football clubs (such as Real Madrid) having Emirates as a sponsor [see: https://humanrightsdefenders.blog/tag/fly-emirates/], but this time the club has done something admirable: Saturday 29 September it has honored Palestinian Ahed Tamimi, who was imprisoned for eight months this year for slapping an Israeli soldier after her cousin was shot in the head, was honored Saturday by the Real Madrid football team in Spain. In December 2017, a video was released of Ahed slapping a soldier in the front yard of her house just hours after her cousin had been shot in the head and put in critical condition by Israeli soldiers who fired at him during a non-violent demonstration. The next day, Ahed and her mother were pulled from their beds in the middle of the night by Israeli soldiers, separated, and imprisoned. Ahed was imprisoned for eight months, and released in July 2018. 17-year old Ahed was greeted by former striker Emilio Butragueno, who presented the teenager with a personalised football jersey. The jersey had ‘Ahed’ printed across the back, and the number 9, which is commonly assigned to strikers who take the front lines of the field and score most of the goals. Fly Emirates? If the Emir lets you! The Emirates proudly sponsor major clubs such as AC Milan, Real Madrid, Benfica, Paris Saint-Germain and Arsenal, but when it comes to flying out of the country there is a problem for those who do not toe the line. A case in point is Ahmed Mansoor, one of 3 finalist for the 2015 Martin Ennals Award for Human Rights Defenders. Today – 15 September 2015 – the 10 international NGOs on the Jury of the MEA (see list below) came out with an exceptional joint statement calling on the United Arab Emirates (UAE) authorities to lift the travel ban imposed on Ahmed Mansoor and to issue him a passport before the ceremony on 6 October in Geneva (in which the United Nations High Commissioner for Human Rights participates). Widely respected as one of the few voices within the UAE to provide a credible independent assessment of human rights developments, Ahmed Mansoor regularly raises concerns regarding arbitrary detention, torture or degrading treatment, and failure to meet international standards of fair trial. He also draws attention to other human rights abuses, including against migrant workers. As a result, Ahmed Mansoor has faced repeated intimidation, harassment, and death threats from the UAE authorities or their supporters, including arrest and imprisonment in 2011 following an unfair trial. He and four other activists who called for democratic rights in the UAE were jailed in 2011 on the charge of “insulting officials”. Although pardoned and released later that year, Ahmed Mansoor has been banned from travel and had his passport confiscated. for the full text of the statement see: www.martinennalsaward.org or those of the NGOs on the Jury.